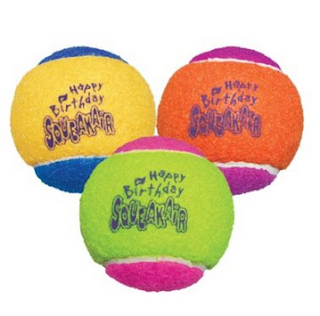 Clipping Chix: Amazon: KONG Air Dog Squeakair Birthday Balls Dog Toy, Medium, Colors Vary (3 Balls) only $2.39 (reg. $4.99) + FREE Shipping with Prime! Amazon: KONG Air Dog Squeakair Birthday Balls Dog Toy, Medium, Colors Vary (3 Balls) only $2.39 (reg. $4.99) + FREE Shipping with Prime! Doggie Stocking Stuffer Alert! Amazon has KONG Air Dog Squeakair Birthday Balls Dog Toy, Medium, Colors Vary (3 Balls) on sale for only $2.39 (reg. $4.99) plus get FREE shipping for Amazon Prime Members!